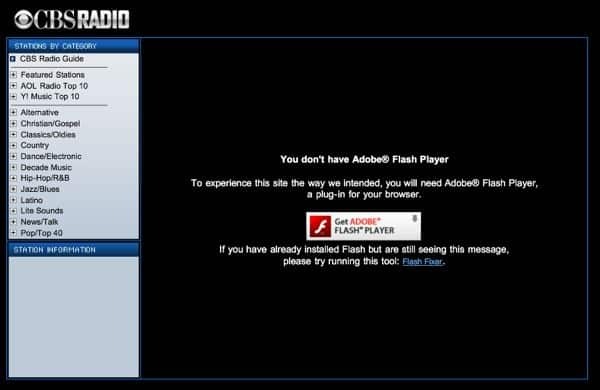 Bleeding Green writes: When I try and listen to live radio or certain TV programming on my iPad, I get a message that says that I need to download Adobe Flash. 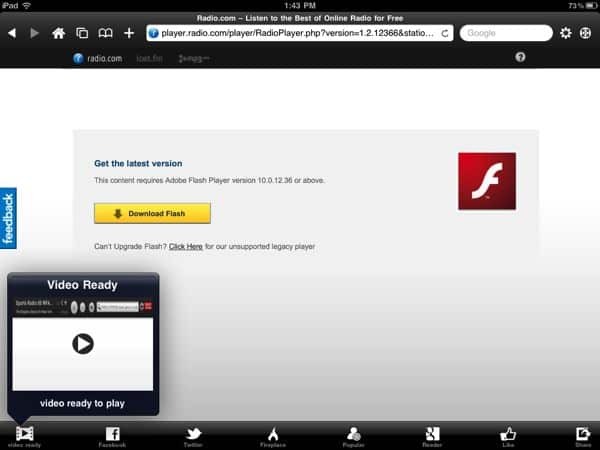 When I try to do this, I get a message that Apple does not support Adobe Flash Player. Hello, Bleeding Green! (Fly, Eagles, fly!) Yes, you’re right—there is a fair amount of corporate intrigue behind Apple’s disdain for Adobe’s Flash browser plug-in. Skyfire for iPad can stream Flash-enabled videos to the iPad—for a price. The bottom line, though, is that for now, there’s no Flash on the iPhone or the iPad—period. And while some Flash sites now boast fully functional, non-Flash versions for the iPhone and iPad, many others still don’t. That doesn’t mean you’re totally out of luck, however. For example, Apple’s YouTube app (it’s already on your iPad) lets you watch just about any video on YouTube, no Flash required, while Hulu has its own iPhone/iPad app for watching streaming videos (provided you’ve subscribed to Hulu’s $7.99-a-month premium subscription plan). And if it’s sports radio you’re after, check out Radio.com, a free iPad app from CBS Interactive that features more than a dozen sports radio stations. Last but not least, there’s Skyfire, a $5 browser available on the App Store that will stream Flash videos to the iPhone and iPad. The process is a tad clunky; you must tap the “analyze” button to check for playable videos, and even then you must wait a good 30 seconds or so before playback begins. But if you’re patient, Skyfire does the trick about 80 percent of the time. Hope that helps, and let me know if you have more questions! Click here for more tips and how-tos for the iPad.